I've currently been asked to seek out a suitable recipient of the sheet-music, band parts (partic. 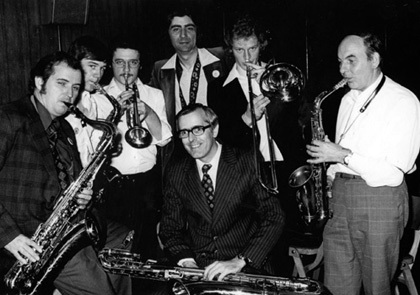 horns/woodwind) and arrangement 'book' of highly respected Jazz and Swing musician / arranger Derek Bridge (centre at rear), who sadly passed 3yrs ago. This is an extensive collection of 'dots' covering an extremely wide-range. His widow would like it to go to an established band/ orchestra as a fitting 50+yr tribute to her late-husband. Contact : Chris 01642-653286.